I love fish. I can go without eating red meat and poultry for weeks on end, but that would be difficult for me to do with fish. It is hard to believe that as a little girl I would not go near any type of fish. Now I eat it raw! I crave it. The more the better. That little girl would never believe it. Lucky for me fish has a lot of really great health benefits. It is a great source of protein and those omega-3 fatty acids that everyone is talking about. Tilapia is my “go to” fish. It is inexpensive enough to eat often. It is sustainable. It has a firm texture which makes it easy to cook with and does not have a fishy taste. Perfect. The herbs de Provance is my secret ingredient in this dish. As with many of my recipes, it was a fluke how the spices all came together. Once I realized how good the combination was I knew it was a keeper. Sometimes I make this recipe once a week. It is so easy and takes no time to prep and cook. I make it just for us on a weeknight and also for company. While the fish is in the oven I make a side dish. I serve it with a baked potato or sweet potato, cous cous or rice pilaf and some vegetables. A healthy dinner and it is always a hit! Spray a large baking pan or foil tray with nonstick cooking spray or olive oil in a Misto. 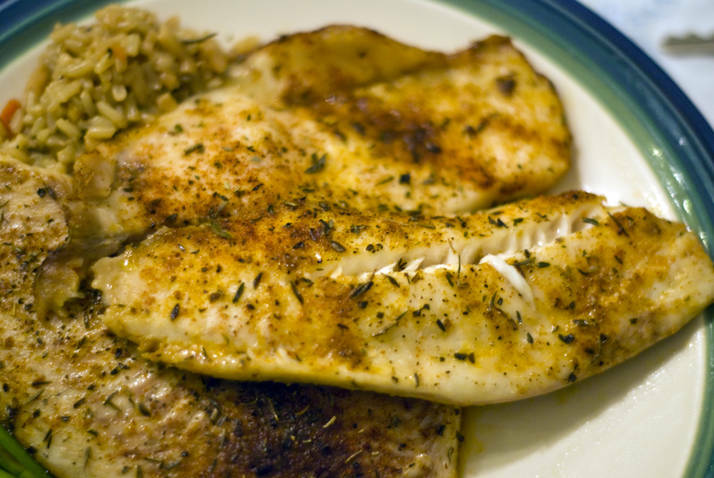 Place the tilapia filets in a single layer on the baking sheet. In a small bowl add all of the spices, salt and pepper. Mix well. Drizzle olive oil over the tilapia and rub into the fish. Sprinkle the spice rub over the fish. Turn the fish over and drizzle the second side of fish with olive oil. Sprinkle the other side with the spice rub. Bake the fish for 15 to 20 minutes depending on the thickness of the fish. 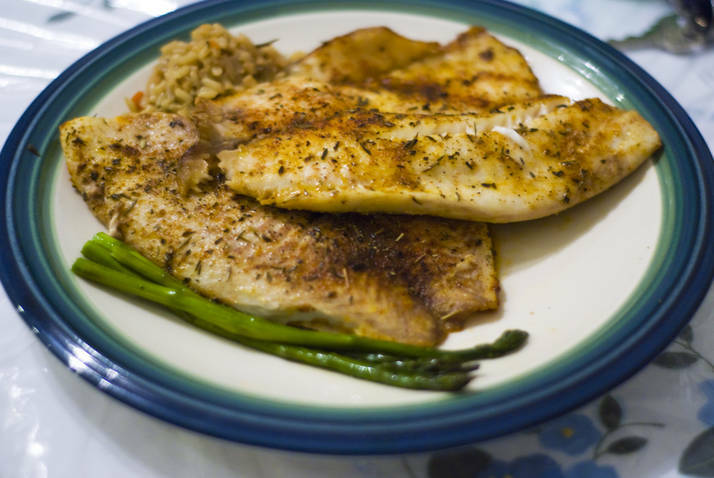 Fish should be cooked through, not opaque and flake easily. Not to sound silly but what is herbs de Provance? and where can I find it? Thanks!